Sunday, we were out running errands and everyone was starting to get a little bit hungry. Rather than grabbing a snack so close to dinner or ending our errands early, we decided that we would stay out for dinner. So, we headed over to Chili's for an early dinner. As a mom, I really like the variety offered on the Pepper Pal kid's menu. They offer eleven main dishes and eleven side dishes. That means that there are 121 combinations possible! Now that is what I call choice. Plus, all of the kid's meals include a beverage. My husband quickly settled on the Monterey Chicken, his favorite dish at Chili's. I, on the other hand, was torn, I couldn't decide what to get at first, but then, I decided to get many flavors all on one dish, by trying their Triple Dipper appetizer as my dinner. There were a number of familiar appetizer favorites to choose from, and a few new items. I decided to go with the new Memphis Barbeque Skins with sour cream, the new Honey-Chipotle Shrimp with ranch and the Big Mouth Bites with ranch. I considered doing the Boneless Buffalo Wings, but decided to stick with some new things instead. If you aren't familiar, the Memphis Barbeque Skins feature potato skins loaded with pulled pork, cheese and Chili's classic BBQ sauce. The Honey-Chipotle Shrimp is a battered shrimp topped with a sweet and spicy, honey-chipotle barbeque sauce. The Big Mouth Bites are mini-hamburgers, complete with applewood smoked bacon, American cheese, sauteed onions and ranch dressing. I loved that I could enjoy so many flavors on one dish. I had never had ranch dressing with hamburgers before and I must say, I rather liked it. I think that I might have to consider making that a regular condiment when we serve burgers at home too. The honey-chipotle barbeque sauce was delicious, but I don't know that I have ever had shrimp with barbeque sauce and it was an unusual experience for me. 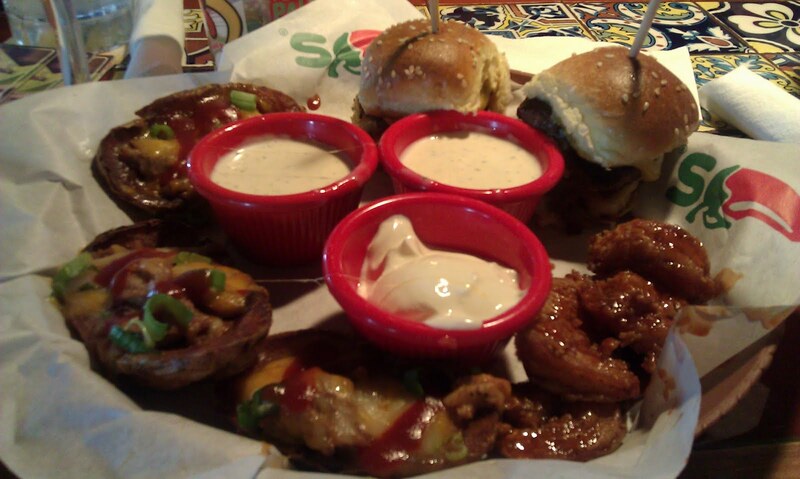 Right now, Chili's is having the Shout Out to Eat Out Triple Dipper sweepstakes. You can enter to win a $20 Chili's Gift Card Daily Prize or a $333 Grand Prize, by creating your own terrific trio by uploading a photo of your face into one of their terrific trio images. A winner will be drawn randomly every day from May 1, 2011 until June 30, 2011. You can find all of the terms and conditions for the sweepstakes on their site. I’m having my own Good Thing Comes in Three’s Triple Dipper Giveaway Sponsored by Chili’s & 2wired2tired.com and one lucky A Busy Mom of Two reader will win a $20 Gift Card to Chili's. To enter: Head over to this form and enter 'A Busy Mom of Two' as the name of the blog hosting the giveaway. Then come back here and leave a comment that you have completed the form. 1. Leave a comment, sharing your 3 favorite foods you would like to have all on 1 plate. 3. 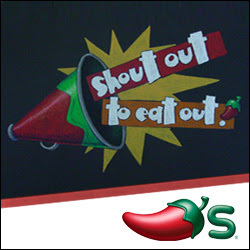 Follow @Chilis & @Shoutout2eatout on Twitter. Leave a comment with your Twitter name. 4. Create your terrific trio located on http://www.shoutouttoeatout.com/ and then come back here and leave a comment with the URL link to your terrific trio. 7. Write a post on your blog about your 3 favorite foods you would like to have all on 1 plate and mention the Shoutout2eatout.com promotion. Then leave a comment with the URL link to your post. Be sure to link back to this giveaway on A Busy Mom of Two! 8. Subscribe to A Busy Mom of Two (or if you already do, thank you!). Leave a comment letting me know you subscribe. "Enter to win a $20 Gift Card to @Chilis as part of the Good Things Come in 3's event. @ABusyMomofTwo http://bit.ly/iGbvaF #tripledipper"
10. Follow A Busy Mom of Two on Google Friend Connect (on sidebar) - leave a comment with your username. The giveaway ends 6/12. Winner will be selected using Random.org random number generator. The winner will be contacted by e-mail (Please make sure that your email address is either in your comment or clearly visible on your profile or blog) and will have 48 hours to respond or a new winner may be selected. After completing these entries, be sure to hop over to 2 Wired 2 Tired (click on button below), to enter to win a gift card from other participating bloggers. No compensation was received for this post. 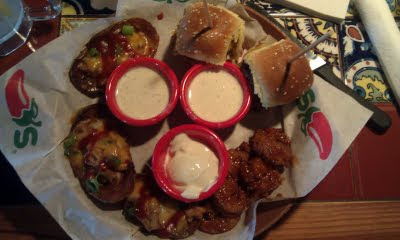 I received a complimentary $20 Chili's gift card, so that I could experience the Triple Dipper and share about it. All opinions expressed are my own. I filled out the form (FYI - it gave me an error at first so you might want to check the link). Thanks for the chance! I filled out the form (the link you have isn't working, I had to take off the http://www.blogger.com/URL part and just use the http://bit.ly/lmlDxZ part). 3 foods on one plate: pizza, bbq ribs, and sesame chicken. I entered your name on the mandatory entry form. I have liked Chili's on Facebook. I filled out the form with your blog name. I created a trio but forgot to get the url. I'd like to have honey chipotle shrimp, boneless buffalo wings, and loaded potato skins on one plate. My three fav foods are chocolate peanut butter cake, pizza, and bacon cheeseburgers. I like Chili's on FB. I Opted-in to Chili's email club. I like wings, cheese sticks and potato skins. Member of Chili's Email Club. Grilled salmon, mushroom and celery. I follow @Chilis & @Shoutout2eatout on Twitter. Leave a comment with your Twitter name. I would love Macaroni and cheese, margarita chicken and strawberries. My 3 favorite foods on 1 plate? French fries, pizza, and ice cream! I would love chilis chips, wings and potato soup on one plate. Three favorite foods on one plate -- cheese burgers, chicken cutlets and chocolate dipped strawberries stuffed with cheesecake filling. YUMMMY! I entered your blog name. Already signed up for Chilis emails. I would love mac and cheese, cinnamon rolls and chocolate cake. I would love on one plate: watermelon slices, mashed potatoes and Cheesecake! 3 of my fav foods: spaghetti, cookies, and shrimp! I’d love pizza, a cheeseburger, and spaghetti on one plate. I completed the mandatory form! 3 fave foods I'd love on 1 Plate: Pad Thai, Smoked chicken skewers and Thai beef salad. Yummmmm. Following Chili's and Shout out 2 Eat Out on twitter as @ninajoleisa. Opted in for Chili's email club. Subscribed to you via RSS feeds.